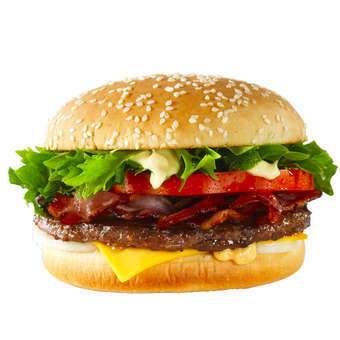 Hesburger's bigger bacon burger was named as simply as possible: the Giant Bacon burger. Inside the giant bun you can taste a large beef patty and some bacon - both of Finnish origin - along with mustard, fresh onion, cheddar cheese, and tomato. We topped this delicious burger off with some crispy lettuce and Hesburger's famous paprika and cucumber mayonnaise. 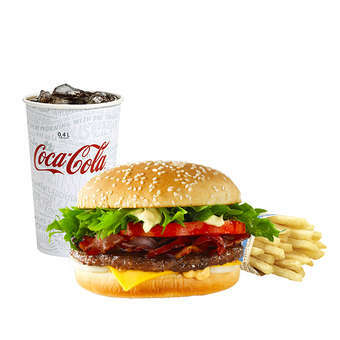 Burger, regular fries and soft drink (0.4 l). A mini salad or baby carrots can be substituted for the fries. Oat drink (0.4 l), fat-free milk (0.2 l), Bonaqua mineral water (0.33 l), whole orange juice (0.4 l), whole apple juice (0.4 l) or Trip raspberry juice box (0.2 l) can be substituted for the soft drink.